'Everybody Can See that I Came a Long Way' – Despite my disability and painful childhood, I'm keeping myself and my daughter safe. ‘Everybody Can See that I Came a Long Way’ – Despite my disability and painful childhood, I’m keeping myself and my daughter safe. I’ve come a long way. Everybody in my life can see that. In my childhood, I was getting abused. It was neglect when I was young, and I was hit by a belt, a switch, anything they get their hands on. I had marks all over. When I was 4 or 5 I was in foster care. After I got home, it was the same. When I was 11, my mother’s boyfriend started sexually abusing me. I got two abortions from him. I don’t even know how I ended up dealing with all of that. I think it had a lot of impact on me and on how I raised my kids when I was young. By the time I was in my mid-20s, I had four boys, and I was raising my sister’s four kids because she passed away. I was getting food stamps, my SSI, their SSI, and I had a home attendant. For four years, I tried my best. But raising eight kids was too much for me. One day in 2007, they were taken from me because of corporal punishment. My mother came with her boyfriend and was helping me, and my 6-year-old was misbehaving. Her boyfriend held down my child and had me hit him with a belt. I was confused. I felt that if I didn’t hit him, I would get hit. My mother’s boyfriend would hit us both. When my kids went into foster care, I didn’t know where to start. My head was going this way and that. My kids were all over with strangers. I couldn’t really see them. Finally, after a year or two, we got them into kinship care. My daughter’s father had family members who took them. 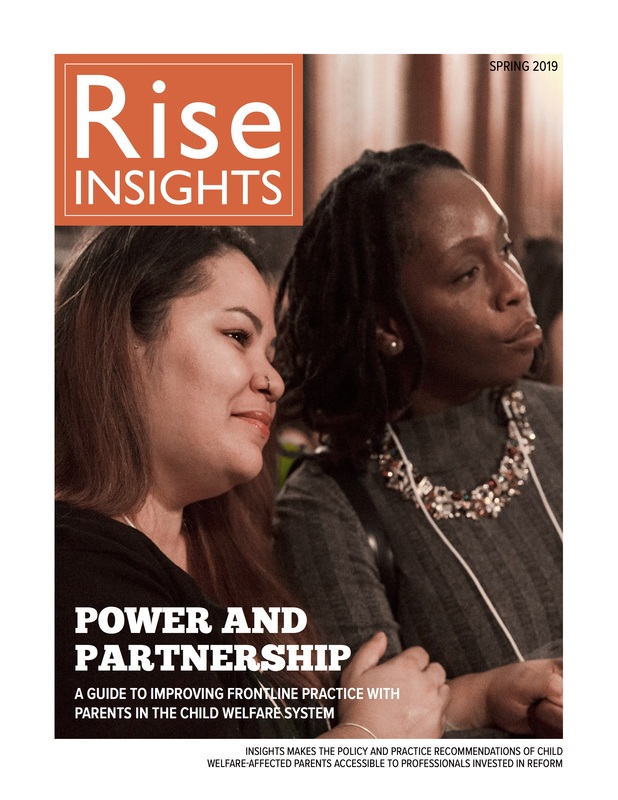 For two years I was doing everything: visiting, taking parenting classes, going to anger management, and doing the Rise support groups at my agency where we read Rise stories every week. I was trying to at least get my two youngest sons back. But my children and my sister’s children were adopted last year. I don’t really understand why my rights were terminated. They say it’s because of my cognitive delays, and I was diagnosed with borderline personality disorder. Also, my oldest nephew was sexually abusing the younger kids. I didn’t even know that was happening. It would be hard to help them recover from that. Now five kids are in California, two are in New Jersey, and my oldest nephew is living on his own. I know that my kids are doing well with family. The girls are on the cheerleading team, dancing, in a choir. My oldest son is on a football team. They’ve got their own room, a backyard. They go places. I talk to them. I call them, I write to them. I send the foster parents Christmas cards and Mother’s Day cards. Still, my hope for the future is to have the family back together again. I know they are going to wind up coming back. Four years ago, while my kids were in foster care, I got pregnant again. This time I had a girl. I wasn’t allowed to take my daughter home from the hospital. For the first month or two, ACS put her with a friend who lived next door to me. Then a niece of her father’s took care of her until she came home in 2012. Everything I did to get her home was helpful. From anger management, I learned to calm down. If she gets me angry, I take a breath, or move away from her for a while, then come and play with her. 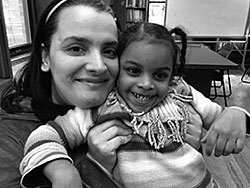 I also did counseling for a long time, and I went to the Bronx Court Project to play with my daughter. I still sit down, play with her, talk to her, help her out, teach her how to do her name, and all that. It feels good. Everybody at my agency was rooting for me to get my daughter back: Crystal, Shanene, Veronica, Gail. When they saw me at the beginning, I was low. Depressed, mad, low self-esteem. I would come to the appointments, and at the visits I would play. My kids and I would eat together. But part of me was there and part of me was not there. Now they see me cheerful, doing what I have to do. I want to thank the social workers and family members that helped me out and believed in me. Their hope and faith—and my own trust in God—helped me through. When my daughter was little, she didn’t really want to come to me and hug on me during visits. Now, every day she gets up and says, “Good morning, Mommy,” and gives me kisses all over my face. Now, there is no abuse. My daughter and I are safe. I’m thankful that I got my daughter back so I can raise her better than I was raised.